If you missed Part 1 of this installment, click the link to check it out. 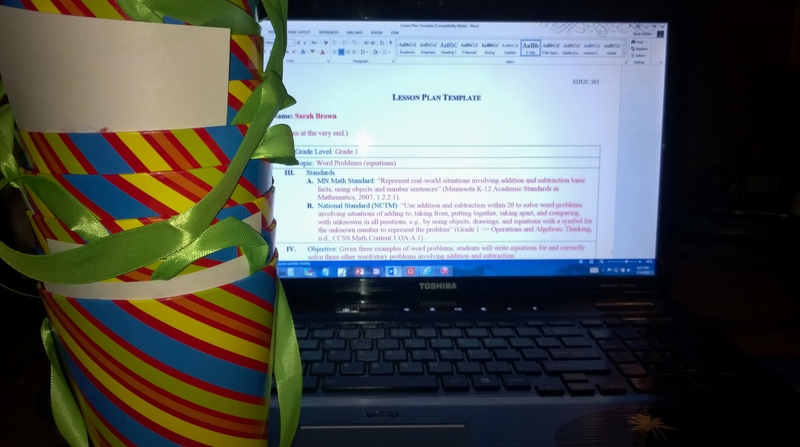 It contains my lesson plan and pictures of the materials I used. Below is the list of reflection questions that professor asked me. Again, my grade for this assignment as a whole was 98%. This reflection in particular, though, my professor said was spectacular. I tried to be very thorough and write in a more conversational style. What did you do before you taught your lesson to make sure your lesson would be effective and run smoothly? Before I taught my lesson, I first wrote myself notes to refer to as I taught, so that I would not forget certain important things I wanted to say. For example, I wrote out the answers to the practice problems, since I felt sure that in the middle of teaching the lesson I would be too nervous to remember them offhand. I also practiced my lesson ahead of time, first alone, and then with my family. This helped me realize what areas needed improvement and revising. When I went over the lesson alone, I realized that I needed to have zeros in my sets of number/operation cutouts. Then, when I presented the lesson to my family, it occurred to me that it took a long time to write out the lines from the story that give mathematical clues during the lesson and decided that it might be better to have them written out ahead of time (so long as I was using a small whiteboard which could be kept out of sight until the appropriate time in the lesson). Describe your “set” (the way you opened your lesson). How did you begin your lesson in order to gain student interest? Was it effective? Why or why not? I used a literature integration and a hands-on activity for my attention-getter. Before I began reading, I explained that we would be learning about equations and asked the students what they knew about them. “Equations have stories behind them,” I told them. “Like, if you see the equation 10 + 3 = 13, the numbers could represent 10 friends who make 3 more friends.” Then I told them that they had to pay close attention as I read the story “Blueberries for Sal” by Robert McCloskey. They were to put marbles (representing blueberries) into containers marked as Sal’s pail or her mouth when she picked and ate them or put them in her pail in the story. At the end, we checked to see if anyone had gotten the correct number in each pail to match the story. This was a very effective way to gain the students’ interest! First, my explanation of the focus of our lesson helped them to know what to be looking for in our introductory activity. Second, the fun story coupled with the fact that they knew they had to listen closely and follow along with a hands-on representative kept them quite engaged! How did the strategies you chose affect the learning and involvement of students? I chose to use guided questioning mixed with direct instruction. I tried to do a lot of “thinking out loud” as I went through the process of deducing equations from stories, involving the students in the process. For example, I said, “Let’s go back over the story of Sal’s blueberries and take a look at the sentences that gives us clues for the math. So, first it says, ‘Sal picked 3 blueberries and dropped them in her pail’ [wrote the sentence on the board]. So, she picked three berries and dropped them in her pail [visually illustrated by putting three marbles in the pail container]. In which equation should I put the ‘3’ then? [called on a student]. In the equation that represents the number of blueberries in Sal’s pail, right! And should I subtract it or add it? How do I know—what words in the story give me the clue that I need to add it? You’re right, it says she put 3 [underlined it on the board] berries in [underlined] her pail [then added a +3 to the pail equation on the board]. Now, if it had said she had taken 3 out of her pail, we would know we would need to subtract it.” My method was a balance between complete student-centered problem-solving and complete teacher-centered lecturing. I maintained control of the flow of conversation, while at the same time involving the students in the flow of thought. It was very effective for this type of lesson, as I wanted them to understand the thinking process. They stayed very attentive, raising their hands, and answering my question enthusiastically and intelligently. How did you differentiate instruction to meet the needs of diverse learners? I did not actively do anything while I was teaching to differentiate instruction for diverse learners, but when I prepared the lesson plan I did so with them in mind. I prepared a very involved lesson with hands-on activities and lots of questions to keep the attention of those with ADD, and I incorporated my student-involved “thinking aloud” method to help the children with LD’s understand the logical thought processes behind recognizing and extracting equations from stories and word problems. How did you close your lesson and summarize/solidify important concepts for your students? At the end of my lesson, I summarized what we went over by again telling the students that equations have stories behind them and can be lots of fun to solve, just like the ones we did in the lesson. I encouraged them to use things like the marbles to figure out the math, and also to carefully analyze the wording of the stories to know what to solve for and how to operate on the numbers. Were you able to involve all students in the learning process? How? Why or why not? For the most part I was able to involve all the students. However, there was one factor that impeded my ability to do so. I only had 6 sets of containers and number/operation cutouts, so I had to break the students into groups. Then, while all the students were paying attention to the story and trying to take part in putting marbles into the correct containers as I read, there were some students in the groups who tried to dominate the activity and others who got somewhat left out. There really was no way for multiple children to put the marbles in at once. I really wish I had had enough containers for each child to have his own set and do the activity alone. How was your rapport among students? Were you able to interact? Why or why not? How can you prove that students met the objective of your lesson? What were some of the evaluations you received from the class? When I presented this lesson to my adult family, I received lots of good feedback. First, my family told me that the lesson was not boring in the least—that the story and the hands-on activities I had prepared made it quite fun and interesting. They also said that the visual representations helped to solidify the abstract concepts. One family member commented that it was difficult to use all the little number/operation cutouts, but the other family member said that she really liked them, and that she thought the children would really like them too—that they were kind of like a puzzle which would be fun for them to work with. However, as stated above, I was not able to use them when I actually taught the lesson due to the fact that I did not have enough for each student to have his own set, as well as the fact that I was running out of time. The children in my class seemed to really enjoy the literature integration. Most of them did not say anything to me directly, but it was evident from their engagement and their enthusiasm. One little boy came up to me after I was done and wrapped his arms around me in a big hug. “You deserve a hug for that,” he said. (I had told them that this was the very first lesson I had ever taught, and that I was going to be a teacher someday.) “If you were a real teacher, you’d be a really good one!” he added. What you will do differently to improve your effectiveness as a teacher? First of all, I will plan accordingly for a small group or a large class, perhaps having a lesson plan option for each. I had originally thought I would be presenting the lesson to my neighbor’s two little girls, but when that plan fell through, I asked to teach it at the charter school where I substitute teach. I guess I had been expecting the charter school to give me a small group of 5-6 students to work with at a table in the hall, and when I was given the opportunity to present to the whole class instead, I found that my lesson was far too geared towards a small group session, and I ended up not quite following it. When I am actually a teacher, all of my lessons will have to be geared towards whole classes of 20-30 students, so I need to become more adept at creating a plan that works well with a whole class. This will involve knowing which activities are best done in a group and which are best done individually. I also need to become better at knowing how to get students to work together in groups, knowing how to keep one or two students from dominating the group and leaving the others out. Then, too, I need to know how to best utilize the time I have for instruction. I need to know which things to cut out or shorten if I am short on time, so that important activities (such as assessments) are not cut out. Next time I will be sure to ask for more time than I think I will need, as it will be better to have a little extra time than to feel rushed and have to cut the lesson down. And thus, my first time teaching goes down in history! Hopefully, I will only get better and better with future experience.